Father Christmas comes to (out of) town! Looking to create an exciting attention grabber for your shopping mall? Father Christmas made an unexpected stop at Whitelelys shopping centre near Portsmouth in the run up to Christmas. 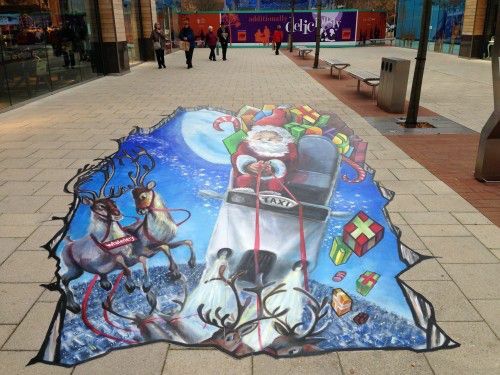 Street Advertising Services were asked to create a spectacular and fun piece of 3d pavement art at the mall for customers to interact with. Father Christmas and his loyal reindeer were featured in the artwork which was designed for children to be photographed on Santa's sleigh. The winning photograph won gift vouchers to spend at the centre. The picture attracted tonnes of attention and hundreds of photos were taken and shared on social media as well as being featured in the local press.